The Klimatec Base 1 AirWater Machine is a self-filling water cooler that can pull pure water out of thin air. AirWater uses refrigeration techniques optimized to condense water from air. Blower driven air is drawn into the system through an electrostatic filter. In the machine's exterior housing, a compressor circulates refrigerant through a coil array located in the path of the air providing a temperature differential between the air and coil surface, resulting in condensation. The condensation is funneled into a holding tank. A level switch in the holding tank controls the water making cycle. Water is pump circulated in an ozone generating UV light chamber to kill bacteria and then through high and low density charcoal filters to remove solids and oxygenates. It is finally collected back in the holding tank. 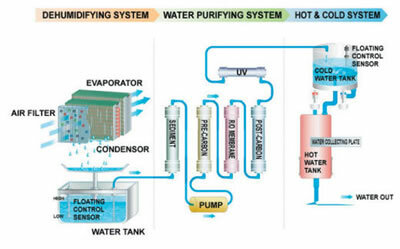 The water filtration cycle is both flow and time controlled. Water is dispensed by tap valve diversion. 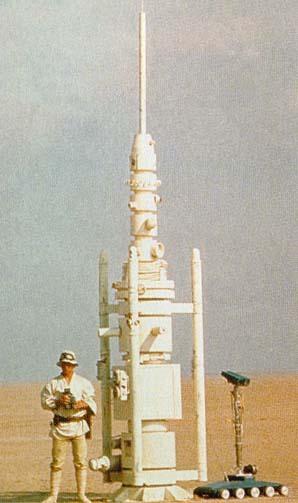 Best of all, it can even be powered by solar energy, which is great news for all you moisture farmers out on Tatooine. From Klimatec via ImpactLab; thanks to Moira for the tip and graphic on this story.